StellaBella: Fall Quiz: Which top was ONLY $19.99? 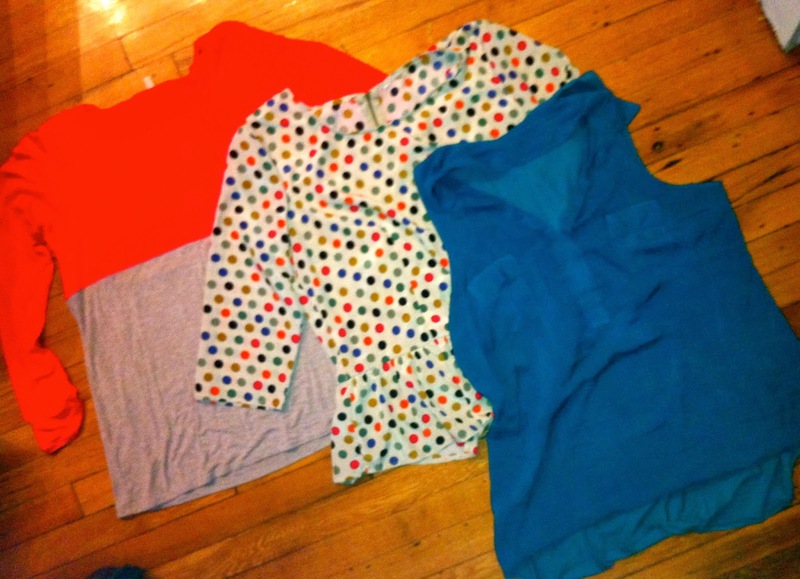 Fall Quiz: Which top was ONLY $19.99? Fall 2012 is here for sure! The other day, I took a photo of the color palette I purchased the last time I went shopping - which looks incredibly close to colors I've been wearing all year, and in the stack of clothes in my vacation photo from this summer! Maybe I just can't let go? I think the bright orange that we were wearing all summer, can translate into Fall easily. Layering is back, so throw some tights on, instead of bare legs w/the same great dress, and a great cardigan or blazer can go over anything sleeveless. The bright colors of summer, can now be used as accents, paired with earthy, Fall tones. The change of seasons is really my favorite time for fashion, (I know I'm not alone there) - mixing from one to the next, and reminiscing on what you wore last year. I'm all about editing my wardrobe every year, and adding items selectively. But when being frugal, I also try to re-invent from any past fashion trends! So, with my pic - I thought we could play a little StellaBella game - Guess the cheap discount store top! In the begining of every season, I like to start by picking up a few trendy tops. My hope is that they will go fine with work pants I have, skirts, and maybe even with jeans on the weekend. The goal is to work them in with pieces I own already. So - StellaBella Readers, let's see how good your High/Low end eye is! Which top was only $19.99? 2 of the 3 were purchased at high end retail, and the other at my favorite discount store! Can you tell which one? REPLY to the QUIZ on our Facebook page!!! MMM: Is it a Girl or Boy? MMM: What’s in a Name?